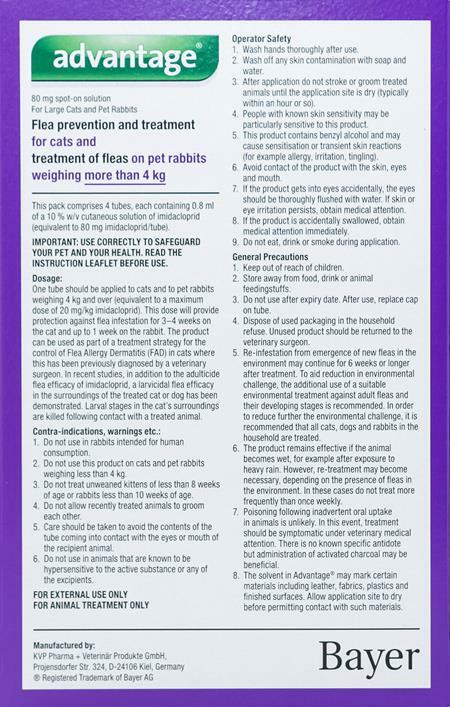 Advantage Purple for cats provides fast relief from fleas. Immediately after touching your cat’s skin, the treatment takes effect and begins killing fleas on contact. Your cat will notice the difference straight away, as the cream stops flea bites within 3 to 5 minutes of application. This is the original Advantage as you said. Our stock is moving fast so all our products are well within expiry dates. Anything for cats that does heartworms, fleas and ticks? Or do I have To apply 2 different medications? Bad ticks around here. Thanks! Advantage 11 also treats the whole lifecycle including eggs. Advantage will kill any live flea, but not the eggs. I use this on my cat, who is an indoor/outdoor feline. He loves to be outside during the day while I'm at work and this product does the job very nicely. I've never seen a flea or tick on him nor has he had any side effects from it. Definitely recommend. Always shipped quickly. Good products, cheaper than at the vet !! I ordered Advantage for cats and the order was shipped quickly and arrived faster than I anticipated. The product was top quality and very fresh and has an expiration date of Feb. 2020. It's the same flea drops you buy at the vets for half price. I'll be buying them again!